Ever meet a real dairy farmer? On Friday, November 8th, city dwellers had the chance to greet 75 New York State and New England dairy farmers who arrived in the Big Apple with one goal. The farmers came to personally give thanks to New Yorkers for their loyalty and support during the first-ever Cabot Dairy Farmer Gratitude Tour. 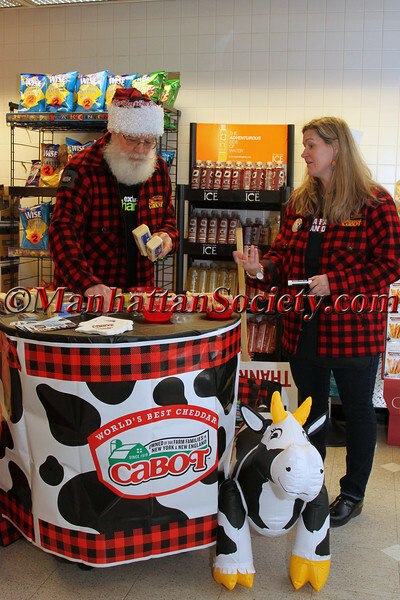 Coach buses, wrapped in signature Cabot plaid, traveled throughout Manhattan and Brooklyn dropping off the farmers at their food market posts, where shoppers sampled an array of award-winning cheddars. The farmers also encouraged passersby on the street to jot down “Why I Love Farmers” (or “Why I Love Cows”) and snap a shot with a farmer to enter an Instagram contest. The winner would receive a 3-day Farm Stay Vacation at Liberty Hill Farm in Vermont. The Farmer’s Gratitude Tour connected New Yorkers with the people responsible for the food on their table. Widely known as makers of “The World’s Best Cheddar,” Cabot Creamery Cooperative is owned by 1,200 dairy farm families. Something many New York consumers learned from their exchange with the farmers is that Cabot is completely farm-family owned with 100% of the profits going directly back to each farm family.